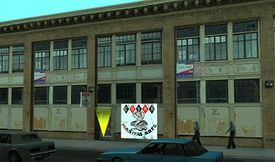 Exterior of the Cobra Marital Arts in GTA San Andreas. Cobra Marital Arts is a gym in Grand Theft Auto: San Andreas. Located in Garcia, San Fierro, the gym becomes accessible after the mission Drive-Thru; however, the player, Carl Johnson, will only be able to access the gym without police attention following the mission The Green Sabre. Carl Johnson can learn some martial arts moves, as well as use the other facilities to increase or decrease certain statistics. Unlike other gyms in San Andreas, there is no boxing ring and the match will end if either character steps off the floor mat. In Carl's instance, this will cause him to lose all his weapons, the same result as if he forfeited the match. Another one of Rockstar Games jokes, instead of M-A-R-T-I-A-L it is spelled M-A-R-I-T-A-L, probably as a reference to "Marital" as in "Marital status". The gym's coach (or master in this instance) has the same character model and voice actor as The Snakehead, seen in the mission The Da Nang Thang. This page was last modified on 19 November 2012, at 17:47.